You might have read last week’s Christmas Gift Guide :: For Her where I started this year’s Christmas blog series; this time I’ve teamed up with my boyfriend to bring you the ultimate gift guide for him! All these gifts are boyfriend approved and something he would love to receive for Christmas but also things that can be great gifts for others too! But of course, I approved them myself so that these are realistically what a girl (me) would buy for a boy/man… I personally love buying gifts for men, however I can see that sometimes it’s not that easy like buying something for a girl, especially if you’re a girl, so hopefully this can inspire you a little! If your boy travels a lot or live on the underground most days of the week, and of course if he owns an iPad Mini, this might be the perfect gift for him! I love the simplicity of this case and how great the strap looks. This is such a cool gift idea especially as stocking filler, and especially if your boy loves crafts and DIYs! This kit includes a terracotta pot, chili seeds and soil, but if you fancy you can make your guy grow a little Cherry Tomato Plant too! I love the look of the winter-y pattern on these gloves, and I’m sure they would make for an awesome gift for boys that like to use their phones/tablets everywhere, even in the cold! I don’t know about yours, but my boyfriend’s weakness must be e-Readers and he’s surely after the new Kindle this year: lightweight, featuring an adaptive front light and a higher resolution, these are a few of the reasons why you should pick the new Kindle, even though I’m still a huge fan of the good old Paperwhite. If your guy likes to read but you want something more on a budget, this Moleskine journal is such a cool little gadget: a tun of fillable sections for all the book’s details, a big space to write his thoughts on every book, cute little stickers and the quality of Moleskine can’t not make for a great well-thought present! A little bit of auto-promotion here – and this is also the first time I talk about this exciting project of mine on here, but I’ve a little phone case line available on Casetify, where my illustrations/patterns can be bought as phone cases for every phone really! Nice, uh? I’ve designed a pair of Christmas themed cases already, and we think the Christmas Sweater case would be perfect for guys! There’s nothing I love more than buying Christmas themed clothes as gifts and if you do too and your boy likes winter prints, than you can’t go wrong with this super cute yet neutral Christmas sweater! 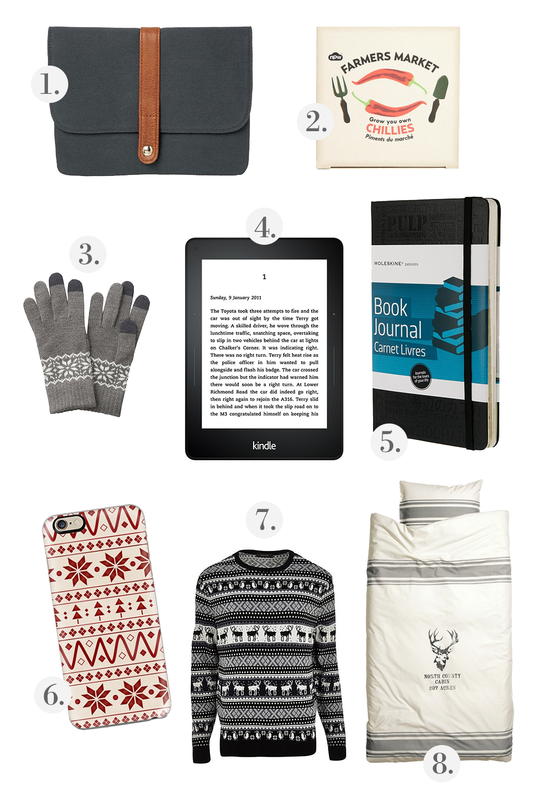 You might remember that I mentioned a duvet cover in my last gift guide last week, and I thought I would include another on here: this deer printed bedding set is perfect for guys and I’ve actually bought one for my boyfriend already and he loves it! Good ideas . I was enlightened by the points , Does someone know where my assistant could possibly acquire a fillable a form copy to edit ?